The Tableau Interactive Viz Contest has finished and what a showing the Tableau community made. Our winner, Alex Kerin, was announced today at The Economist Ideas Economy Conference. Take a look at Alex's viz and some of the other highlights below! Alex's viz is both simple and stunning at the same time. 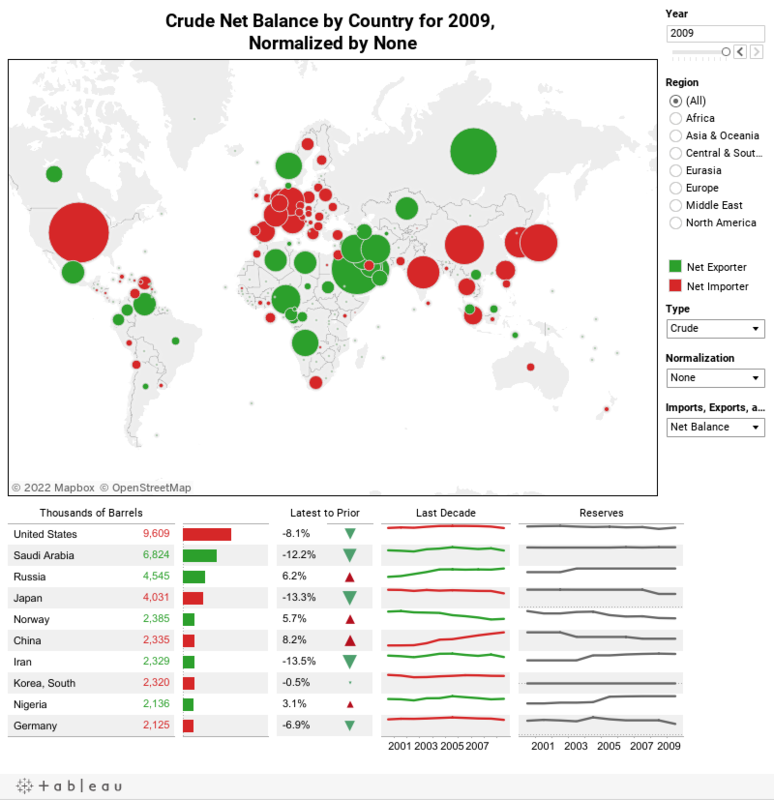 The massive variation in oil imports between countries is instantly visible, and time trends are beautifully displayed in sparklines below the map. Nice work, Alex! Make sure to check out Alex's blog for more amazing vizzes. By directing the most traffic to his viz, Andy Kriebel has won the Crowd Favorite and $500! His beautiful viz takes a look at the share prices of Coke and Pepsi over the past 30 years. Unfortunately, the contest was not open to people outside of the US due to legal difficulties in awarding prizes. Luckily, Jerome Cukier and our old friend Russian Sphinx did not let that stop them. Take a look at their vizzes below. Russian Sphinx's viz is simple yet engaging. Take a look at real estate prices and quality of life by district in Moscow. Jerome Cukier has grabbed every real estate transaction in Manhattan over the past 7 years, and his findings are fascinating. Click into the year in the top right hand corner to view transactions over time. I like all of these. Nice works folks! Downloading Alex's viz seems to stop the date filters working on the first dashboard...any ideas why?